Sources tell The Bolingbrook Babbler that the Village of Bolingbrook is considering seizing control of all newsstands in Bolingbrook. The sources also say that the move is not related to two negative stories about Mayor Roger Claar published in the Chicago Tribune. "Roger thinks newspapers are ripping off the residents of Bolingbrook." Said Steve, a source close to Mayor Claar. "He said, 'Steve, take the Chicago Tribune for example. They've cut the size of paper, charge the same amount, and then cut back on the amount of real news they print. The way they treat their readers is criminal!'" 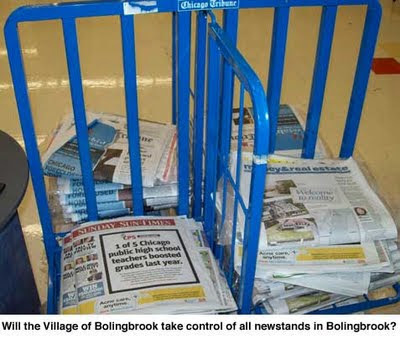 According to various sources, the village may use its power of immanent domain to seize all newsstands, boxes, and any physical object in Bolingbrook used to distribute daily, weekly, or monthly publications. The publications would then have to negotiate with the village if they want to sell their publications in Bolingbrook. Individuals who hand out publications would be immune, provided they do not use a "permanent" object to store the publications. Steve says Claar cited his own recent experiences with The Tribune Company. "Roger said, 'First they wrote two articles in their paper, trashing my reputation and my golf course. So my critics bought their newspaper, and supported their advertisers. Then I'm brought on to a WGN radio show to present my side of the story. So my supporters drove up their ratings, and bought products from their advertisers! They played both sides!'" All the sources agree that Claar believes that the Village can use its new bargaining position to improve the quality of articles about Bolingbrook. According to Steve, Claar said, "We have a low crime rate, but when is the last time you read about that in a newspaper? No, all they want to do write about my campaign fund. Let me tell you this. My campaign fund proves that an entire community loves me. Sure those reporters are loved by their families, but do they have campaign funds?" Village attorneys are trying to determine if such a move is Constitutional. They are testing the argument that The First Amendment only applies to free speech, not paid speech. Because newspapers charge for each issue, the argument goes, they are not a protected speech, and fall under the Village's power to seize property in the public interest. The attorneys expect to have their recommendations ready before the next Village Trustee meeting. Steve says that Claar knows this is a very unusual move for a mayor. "He said, 'Steve, I hate socialism as much as the next Republican. But when it comes to my reputation and my water bill, I'm willing to make exceptions.'" When The Babbler called Claar for his comment, he replied that he couldn't talk because he was in the middle of an "extra-thorough" audit of his future campaign spending plans. During the conversation, a man in the background said, "You cannot charge a hot tub to your campaign fund." "It's for my therapeutic spa!" Claar replied. "You try canvassing neighborhoods at my age. Then you'll understand!" God to smite Bolingbrook on 8/7/09. I think its high time that every citizen/business looks at their own finances.... and government. Not to get into stupid parking meter deals but to protect their own interests.